Well, like usual, I'm late to the party! 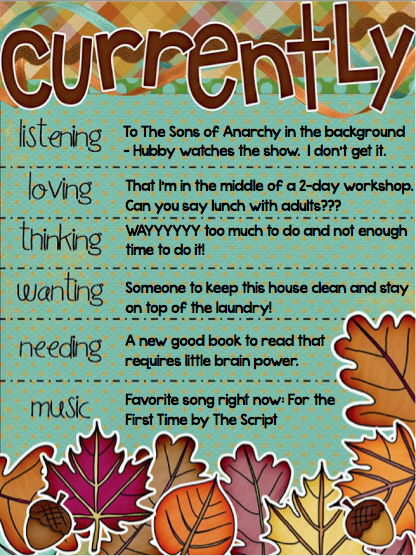 So better late than never I guess, I'm linking up to Oh' Boy 4th Grade's November Currently. Loving: Right now, I'm taking a 2-day workshop on about how to differentiate instruction with struggling readers who have persistent difficulties. Today was the first day. Nothing too ground-breaking so far but I'm keeping my fingers crossed for tomorrow. I'd really love some ideas about teaching decoding and sight words that will stick with my students! The best part is......LUNCH with adults and not with students and at a restaurant. Oh so nice! Thinking: Overwhelmed......way overwhelmed!!! We move in 36 days. :( But I'm trying to be positive because we're going to beautiful Hawaii. Still excited but leaving here is very hard. Wanting: The laundry and house cleaning battle is definitely a loss for me right now! I just can't keep up.at.all. Needing: I so need a good book to get lost in that requires little brain power. Does anyone have recommendations? Music: I love the song For the First Time by The Script. I know it' been out for awhile, but I still love it. So I promise I'll be back soon to update on the Whole Brain Teaching, my training, new stuff I've made, and all the other stuff. If only there was someone to keep the house clean and the laundry done... someone free at least! I'm with you sister! Thanks, Corinna! I'm starting to feel much better about the moving and leaving my job situation. I'm looking forward to the future and new adventures ahead! And I'm hoping there's a school there that might need a special ed teacher mid-year. Keeping my fingers crossed! If not, I guess I'll need to spend the days sitting at the beach while the kids are at school!